Cypress is the best outdoor wood you can get. It is insect resistant wood and will last you a lifetime. You won't find a better quality swing than these. 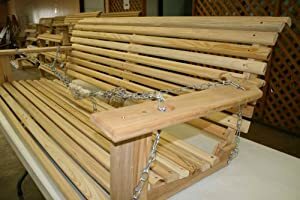 You can enjoy all kinds of outdoor activities on your porch or where ever you choose to hang your swing. You can paint or stain your swing according your liking.